Today, I had my follow-up visit to discuss my gluten intolerance labs. Do I have gluten intolerance? Oh hell yes; yes I do. My IgA (mucosal) value was normal, but the IgG value, which should have been 17 or less, was apparently well over 100. Awesome. Gluten intolerance. Barbara was right – but this should come as a surprise to precisely no one. The woman is a wonder. It was the perfect opportunity to use, “yeah, the only things I’ll be allowed to eat are sand and cranberries now.” He laughed aloud and then we talked about Resources. I told him about PHawk and Barbara and Stacey’s friend Kelly, and how I can avail myself of them and the hundreds or thousands of gluten-free websites and blogs. I lamented availing myself of D&W’s massive boxed pasta sale a couple of months ago, wherein I purchased 10 boxes of dried pasta for like a dollar. I realized, however, I’ve done this before. Meat is everywhere, too – it’s in so many prepared foods, often in the form of “natural flavors.” It’s in most commercial yogurts and many sour creams (in the form of gelatin.) I’m used to scouring labels – I can do this. One thing I haven’t had to worry about, though, is cross-contamination. A lot of facilities used to process non-wheat grain items also process wheat, and the remnants can cause problems for people with gluten sensitivities. Breakfast: Bowl of unset chocolate pudding. Tea. Lunch: Portuguese kale soup – you know what that goes great on? A slice of rye bread, that’s what. So I had one of those, too. Ok, I had two. Big glass of milk. Afternoon: Two stalks of celery and several pots of tea. Infinite trips to bathroom. Dinner: Altu’s Ethiopian food with delicious teff injera. The kind of gluten sensitivity he referenced is the elevated IgG and normal IgA values, with little or no gastrointestinal symptoms. We in this group are afflicted with other, systemic symptoms, such as a general sense of apathy, low energy, low motivation, depression, skin irritation or flaking, weight gain, chronic fatigue syndrome, muscle weakness or pain, neurological symptoms, et cetera, et cetera, et cetera. Thinking about how most people tend to see allergies (acute-onset symptoms, which may be localized to the affected area (bee sting, topical exposure,) it’s easy to see how “allergic reaction” wouldn’t come stampeding to mind when looking at the whole presentation. Listening to Science Friday on the way to and from my appointment, they were discussing depression and its many potential causes. A listener who was also a physician called in, wanting to underscore the importance of chronic inflammation in the depression process. If I’ve got a systemic, internal inflammation going on, I can see how that might mess pretty much everything up. Barbara knows this; she’s been reassuring me all along and telling me how much better I’ll feel without gluten in my life, even before I was diagnosed today. She recognized the symptoms she and her family experienced, and she’s been ministering to me, providing resources, recipesand information. Bless her heart. Over the last couple of weeks, I’ve done a little half-hearted gluten-free diet research, and while I’m not happy about the diagnosis, the outlook isn’t as bleak as it could be. Much like advances in the vegetarian arena, there are a lot more gluten-free-friendly products to be had. I can find other ways to make bread and dumplings and cookies and WWWAAAAAAAAAAHHHHHHH I want my gluten back already. I nearly shed a self-pitying tear on the way home. But life is not over, we muster ourselves and we carry on, yes we do! Riiiight after a nice, relaxing, pity-party bath. How relaxing would that bath be whilst inhaling paint fumes? Probably not very. Sabotaged by my own visions of serenity! Which brings us to today’s Progress Report. I really, really want to have this all done by Sunday, and I still think it’s an attainable goal. Today’s work was more about details than broad strokes. 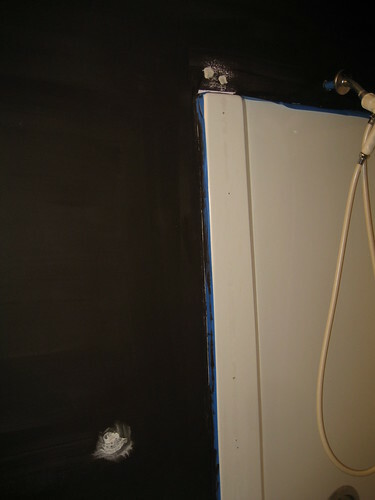 The first coat is down, except for the bits around spackled holes – the spackle is curing for another little while tonight. I taped everything except most of the ceiling (because I hate taping the damned ceiling,) and got two coats of edgework done. Except on the ceiling. 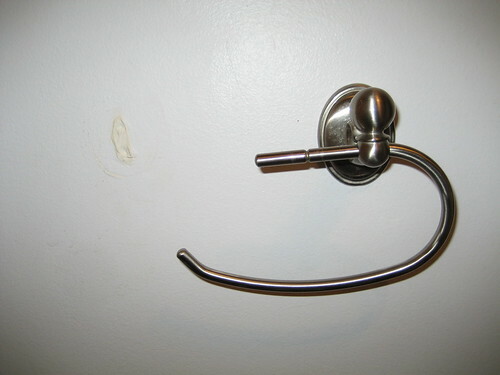 Cuz there’s no tape there, except immediately over the door. 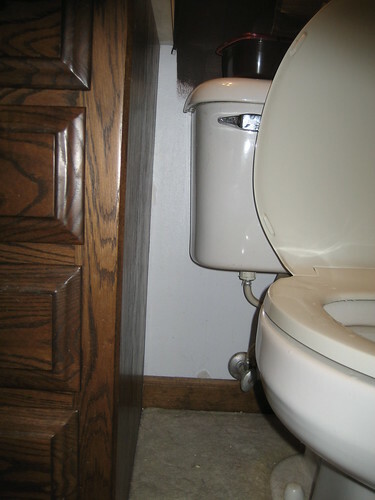 Of course, there’s the previously-mentioned cardboard wall behind the mirror, but that’s hard to see in a photo. Our gorgeous sunroom, built entirely by the previous owner, has some fit and finish issues I’d eventually like to finish, and his ad hoc painting of the dining room leaves a bit to be desired. 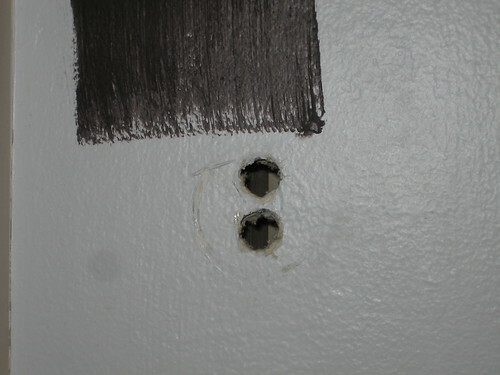 Spackled, but not sanded or painted. I’ll eventually replace that holder with one that fits the other bronzed/rubbed oil hardware I acquired. Even though it’s all smelly and not done yet, when I close the door and look around it’s very den-like. I cannot wait until it’s done and decorated! Mike Neir even offered to help with the ceiling stuff, since he’s taller. What a guy. 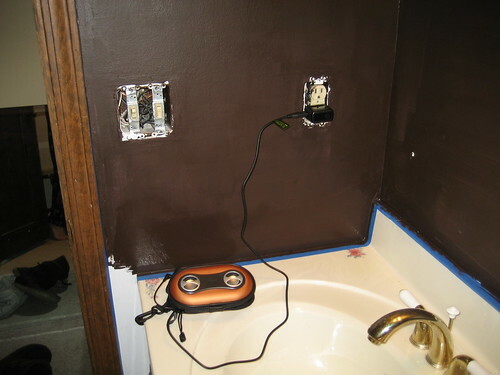 I should have spackled this yesterday, but drugs prevented me from thinking clearly. No drugs today, and my fever was down to 99.7. Sweet! After my checking account recovers from yesterday’s spending spree, a new faucet will be a welcome addition. No more brass!! 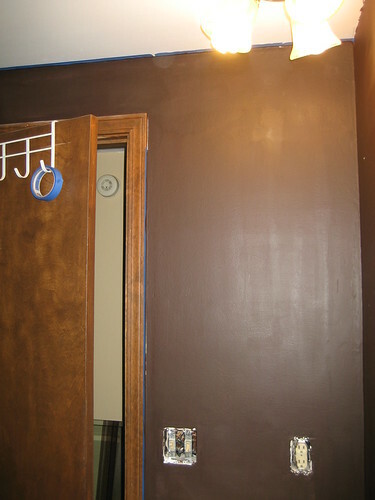 I’ll be taking down the brass light fixture and painting it, as well, either white or the brown. 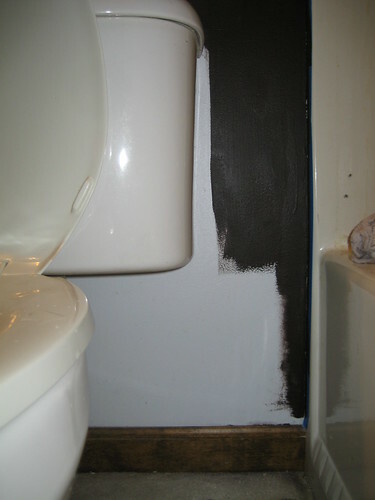 So – drain and yank toilet, apply two coats of paint back there, plunk new wax ring down, squish toilet down and affix anew, boom, done there. 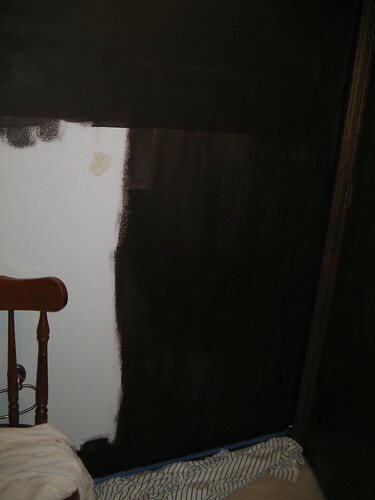 Once the spackle is dry, I’ll be sanding/sponging those six areas down evenly, painting the first coat, and then I’ll throw a final coat of paint on with The Dreaded Roller in the Very Enclosed Space. I still think Sunday is doable. That gives me all of tomorrow, with the added application of Mike Neir Where Required. 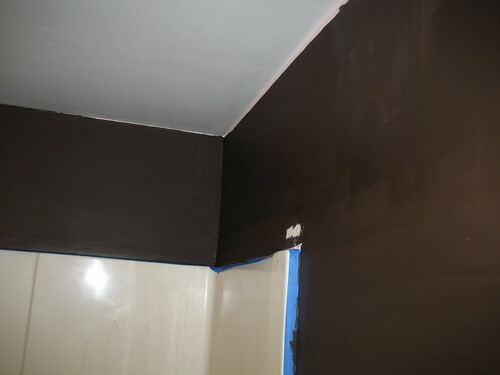 Perhaps by Sunday night, the fumes will have wafted away (too bad they don’t make VOC-free paint in ludicrously dark browns) and I can enjoy my new-found bliss. I can’t wait to hang the artwork and shelves and new hardware! Yay, sanctuary! Boo, gluten stuff, but yay for future better health! Someday, I may actually write about quilting again. Heck, I may do some actual quilting. In the meanwhile, my domain name might be better served by homesteadgeek.com (thanks Phawk), or stupideffingglutenintolerance.com, or simplifymyridiculouslife.com… but I suspect those who were only interested in the quilting stuff have long gone away at this point. Right then – there’s a fierce wind whipping outside, Mike Neir is stuck at work for the foreseeable future, and I believe it’s time to make a fire and do some gluten-free living research. I think Pat Sloan already grabbed “deathbyquilting”. she uses it for swaps and speed quilting challenges. Fun Stuff! Good luck with the gluten-free diet. I’m sure you’ll feel better when you’re not eating poison. 🙂 I just know one of these days some doctor is going to tell me that diet Coke is poison to me, then I’ll have to kill him.